We arrived at Phalaborwa gate around noon, after an uneventful drive. Check in went smooth, as usual, followed by a celebratory ice-cream. Since we were already inside the Park fence, we considered it fair to start counting bird species, and promptly ticked off the first few, while eating our ice-cream! Then, after unpacking one camera each and mounting the Go-pros on the car, we were ready to enter that park. 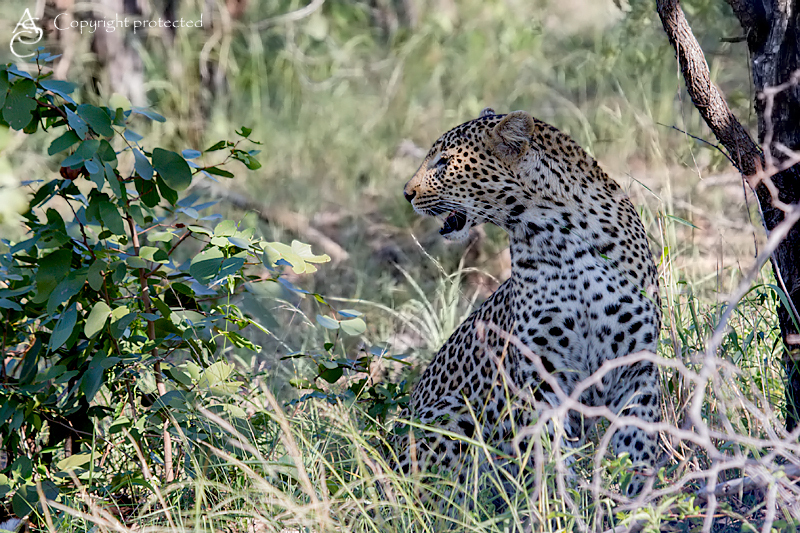 That special moment when you switch off the radio, lower the windows, and suddenly see nothing but bush around and ahead of you will never loose its magic! First stop – Sable dam (a.k.a. The elephant swimming pool!). What a sight! Dozens of Elephant, drinking, swimming, playing, play-fighting, fighting and generally enjoying themselves… It is a great pity that the light was absolutely horrible by then, but that didn’t make the sighting any less enjoyable. All too soon, we had to hit the road again. We took the H14 towards Mopani camp, and had a relaxing hour or so, cruising through the thick Mopani forest with no other cars in sight, just taking in the smells of the bush, enjoying the beauty of nature and feeling the stress of the past 2 and a half years flowing out of our bodies. About 18 or so kilometers down the H14, we found a little turnoff, leading to a viewpoint overlooking a stream, and spent much too long there, ticking off 8 more species. We carried on, satisfied with our quickly-rising species count, but slightly frustrated that none of these sightings provided real photo opportunities. Suddenly, my eye caught a movement in the road ahead of us… I looked, and my jaw dropped. Still struggling for the right words, I looked at Johan and pointed. He was also pointing. 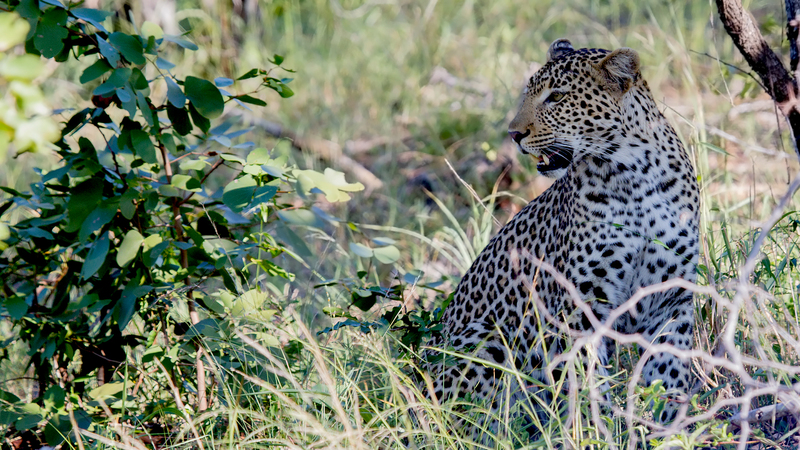 Then he braked, and we stopped right next to the beautiful leopard, who had by now crossed the road, and sat down at the edge of the tree line, looking at us and posing like supermodel! 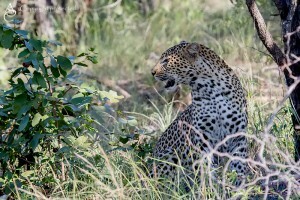 We spent a few minutes photographing him, before he apparently got bored, yawned, and walked off into the thick bush. 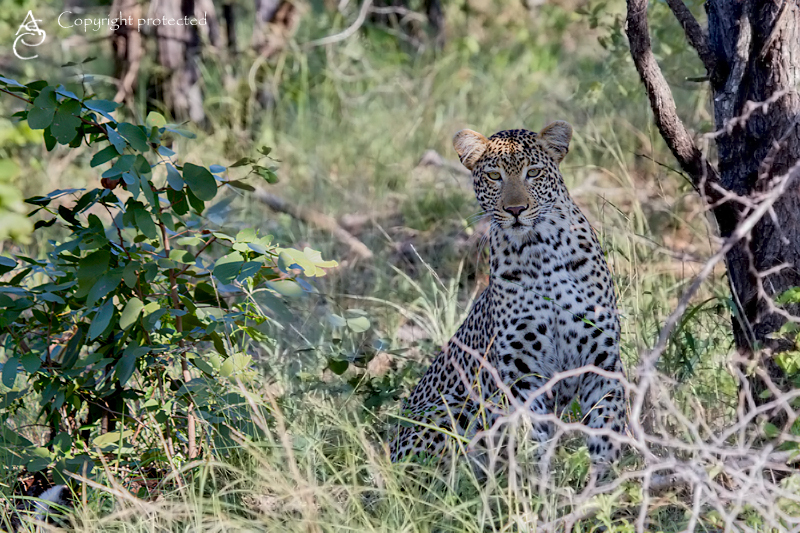 Within seconds he was nowhere in sight, and we only had our photos to prove that there ever was a leopard there! Being seriously behind schedule now, we still managed to tick off a Lesser-striped Swallow, European Roller and African Grey Hornbill (19, 20 and 21), before arriving at Mopani about an hour before gate closure. We only had time for check-in and a quick visit to the shop to stock up on wood and charcoal before we had to drive to the hide. Then the sun went down and… Magic! Thousands of fireflies everywhere! The sky above the river was filled with tiny specs of light. It was like a scene from a fairytale! We tried to take photo, but alas – no photo can capture that. So we sat and watched in amazement, until the moon came up and the fireflies started dispersing. The rest of the night was quiet, but the atmosphere was still absolutely magical. Since the moon only rose after 9pm, we had ample time to admire the intensity of the stars – something that is always a huge treat to us city dwellers. We kept dinner simple – boerie rolls and coffee. Inside the hide once more, we resisted sleep, too caught up in the atmosphere and too afraid that we might miss something. Instead, we sat on the benches with two of the viewing slots left open, scanning the river bed with a spotlight every now and then. For some strange reason we whispered softly whenever we did talk, which wasn’t often. Mostly, the only sounds were the hippos snorting, some (sadly unidentified) birds and insects, and once – a lion roaring far in the distance. When we finally did sleep, it was for short bursts and one at a time, with the other one keeping a lookout. 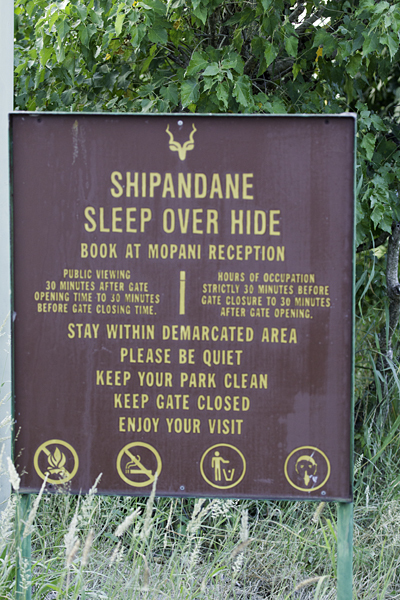 Shipandane is one of two hides in Kruger that can be booked for an overnight stay. 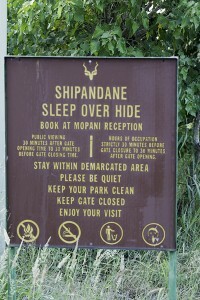 It is located near Mopani Rest Camp, overlooking the Tsendze river, not far below the Pioneer dam wall. When you check in at Mopani Camp, you are provided with a set of keys. These keys unlock the toilet (long-drop! ), the gate that gives access to the braai area, the fold-down beds, and the cupboard containing mattresses for the beds. One of the staff members will also deliver a utensil box, bedding and some paraffin lamps to the hide, if you require it, at no extra cost. There is no running water, but we were told that we were allowed to shower/freshen up at Tsendze the following morning, although we didn’t do so. The one downside for us, compare to Sable Dam, was that you cannot pull your car into the enclosure. This means that you cannot access your car after sunset and have to carry everything you will need into the hide, and carry it back out to the car at sunrise. It can become a bit of an issue if, like we did, you forget the butter in the fridge in the car! Keep dinner simple. 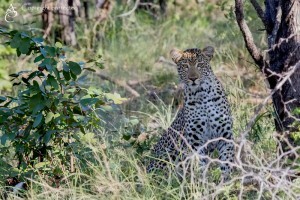 You don’t want to be outside, minding the braai, if something worth seeing happens in front of the hide. The utensil box included a kettle suitable for use on the fire, but we took our own anyway, just to be sure. Coffee is essential! Take warm clothes / sleeping bags. The draft through the hide gets freezing cold in the early morning hours. Take a decent spotlight, but remember not to shine it into animals’ eyes! Tale a cushion of some sort to site on. Those narrow benches get hard after a few hours! Take extra snacks – if, like us, you feel that your time alone, at night, in the bush is too special to spend it sleeping, the night gets long. Don’t make too much light in the hide. You can see better outside if you let your eyes become accustomed to the dark.